In a sleepy piazza two minutes from the Pantheon you can find a slice of Sardinia with a lot of heart. This shop stocks specialties of the island (liquors, cheeses) and a selection of delicacies from southern Italy (capers, tuna). It also has a minuscule kitchen that serves up a handful of appetizers and first courses. Take a seat at one of the three tables outside next to the parked Fiats and Stefano will come over to tell you the menu: to start you can choose between a buttery burrata with pickled vegetables or a tomato and mozzarella salad, artfully arranged on your plate. Then take your pick from a variety of pastas ranging from culurgiones (Sardinian ravioli) stuffed with potato and served with a tomato sauce to a Sardinian cous cous platter with a creamy fish sauce. Finish your meal with seadas, a typical pastry stuffed with ricotta, fried and then drizzled with honey. 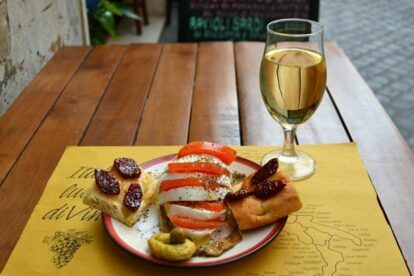 Or if you prefer to stop by for an aperitivo, you can also order a glass of wine and a platter of cold cuts and cheeses to whet your appetite before dinner.